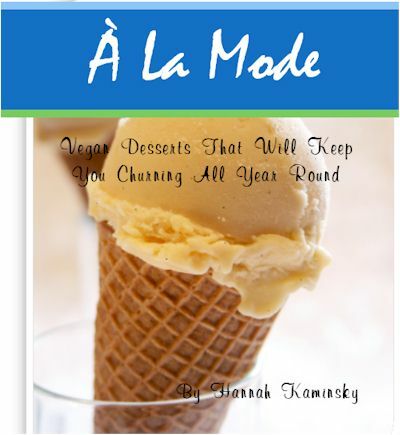 Just when you thought vegan ice cream had reached its limits, Hannah Kaminsky, author of My Sweet Vegan, takes it to a new level. Just when you thought vegan ice cream had reached its limits, Hannah Kaminsky, author of My Sweet Vegan, takes it to a new level. This creamy collection combines nostalgic flavors with Hannah's gift for creativity, resulting in delicious recipes (a cool baker's dozen) that will satisfy, delight, and amaze. For just $5 you will enjoy recipes for Birthday Cake Ice Cream, Buttered Popcorn Ice Cream, Chai Latte Ice Cream, Cherry Cola Ice Cream, French Vanilla Ice Cream, German Chocolate Ice Cream, Jam Ice Cream, Maple-Pecan Ice Cream, Oatmeal Raisin Cookie Ice Cream, Peanut Butter Bombshell Ice Cream, Peppermint Crush Ice Cream, Rose Petal Ice Cream, and White Peach-Rosemary Ice cream, each with an accompanying full color photo, tips, and options.